Where do I use my Cosyfeet voucher code? Once you have finished shopping go to your basket by clicking ‘Checkout’ in the top right corner of the page. On the basket page below your total, you will need to select a delivery option. Below the delivery option is where you can now enter your code. Enter your code into the box and click ‘Apply code’. Your grand total will automatically update with any discounts. "Sign up to the newsletter for great deals and offers." "No quibble guarantee on all products." Men and women both can pick from designer-inspired styles of slippers, loafers, work shoes and boots in EEEEE+ and HH+ sizes to comfortably protect and support swollen or bandaged, and the socks and hosiery to suit them - from diabetic friendly socks, Softhold socks and knee lengths to tights, stockings and hold-ups. Cosyfeet also offers nail care, creams, lotions, specialist insoles and bathing products for ultimate foot comfort. Cosyfeet’s considerations to your quality of life don’t stop at your ankles, either. They provide a wide selection of lifestyle products, from in-car back support, pain relief devices, blood pressure testers, swelling reduction machines and handy helpers to make your day to day life as pleasant as possible. With a discount code from Cosyfeet, you can make great savings on your purchase. Discount codes can offer you saving on a minimum spend such as "15% off when you spend over £100" or "10% off when you spend over £50" or savings on select products like "15% saving on selected Foot Comforts" or they might offer you free delivery on your order e,g, "Free shipping to your Home when you buy Fabric Shoes" or "Free Delivery on Cosyfeet sandals" or sometimes there is a code offering a free gift with a purchase such as "Receive a Free Pair of Professional Nail Clippers when you spend over £50" or "Get a Free Pot of Tired Legs Cream when spending £60 or more". Here at NetVoucherCodes, we make sure that you get to know about all of the codes and money saving offers there are available at Cosyfeet, so be sure to check here before you make your next purchase. Cosyfeet offer cosy comfortable socks that are manufactured from high-quality yarns that are made to last. Cosyfeet is so sure that once you've tried them you will never want to wear any other sock, they say that if they’re not the most comfortable, best-fitting socks that you have ever worn, you can return them free of charge at any time and they will give you a full refund. Shop here for men’s and women’s socks, warm socks, lightweight socks and socks for sensitive feet. make your choice from Softhold® socks that never pinch or squeeze your feet, seam-free diabetic friendly socks or super-soft warm and cosy bed socks. Whatever kind of socks you are looking for, you are sure to find it at Cosyfeet. 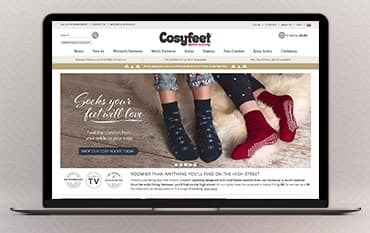 Cosyfeet provides a range of extra roomy EEEEE+ slippers for women and HH+ slippers for men that are designed to fit over feet that are bandaged or swollen or simply very wide. They are made to give support and stability. They come in a range of different colours and styles including warmly lined bootee styles for winter and lightweight open-toed styles for summer lightweight, which are suitable if you have problem toes or bandaged feet, and in a choice of fabrics including plain, plaid and corded. They all have an easy touch-fastening for a truly flexible fit and most styles are machine washable. It is also possible to buy a single slipper, which is ideal for amputees, people with only 1 bandaged foot or those with different sized feet. Before you buy, check out the discount codes available at NetVoucherCodes to see if you can save money on your purchase. Yes. Cosyfeet provides a full money back guarantee on all products. What fitting is Cosyfeet footwear? All the footwear at Cosyfeet is wide fitting. Cosyfeet make extra roomy footwear, socks and hosiery for both men and women. Use our Cosyfeet Offer Codes to save money on a massive range of shoes and boots. Cosyfeet footwear is designed to be comfortable shoes for people suffering from swollen feet or naturally extra wide feet. Cosyfeet is recommended by top health experts.